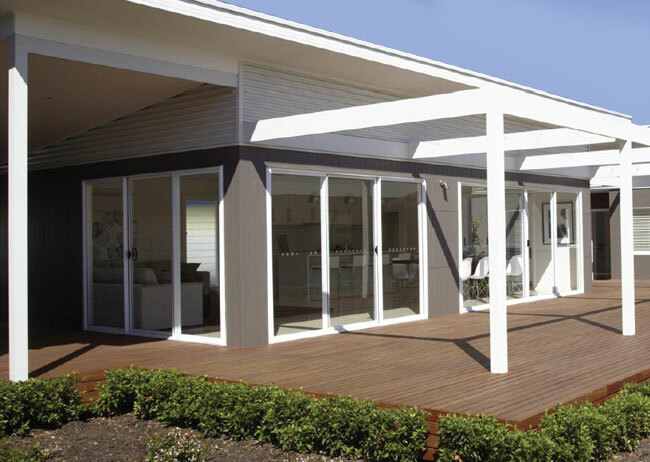 Tactically, decking is a top option for creating outdoor areas on uneven or sloping blocks. Choosing to pave on these types of blocks may require excavation work or retaining walls which can become costly. "Decks are a great solution for sloping blocks. They can be built over undulating ground at an even level to the home, which means that earthworks can be minimalised," Sarah Homes' Helen Lowrie says. "Decks can also be used as steps, so you can have more than one level in the deck which also saves on earthworks. Most blocks of land have some slope to them and decking can provide all sorts of solutions at a fraction of the cost of retaining walls." Building over existing factors, such as the damp course and drainage, rather than re-doing ground works will also save money, especially if you want to make the outdoor area level with your indoor spaces. "With paving you can't breach the damp proof course of the home and it needs to sit down under this," Helen says. "Decking can sit above this course which means that maintaining the floor level really does make the outside area feel like more of the home." Cost savings, enduring looks and the warmth of natural timber are only some of the merits of timber decks At this time of year, my thoughts are returning to extending our living space outdoors and how to make it work without a great deal of expense or too much effort. "Get someone in to do it," is the response I often hear, but living within a budget doesn't always make that so easy. When creating an outdoor room or alfresco, or even just a nice area to laze in the sun, there's two main options: you can pave or add a deck. Lifestyle builder of holiday homes, Sarah Homes, includes decking areas as standard in many of its home designs for their beauty, simplicity and because they fit well with the natural environment. Sarah Homes' Helen Lowrie says timber decking is much loved for the warm tones and feel it gives a home. "Decks look great, they are easy to clean and because they can be built at the same level as the floor on the inside of the home, they can make the overall feel of the home expansive," Helen says. "This is particularly true when the outside area is under the main roof, which really gives the feel of an outside room, rather than just an outside area."